Degenerative scoliosis of the lumbar spine is a consequence of the natural deterioration of the intervertebral disks with age. The biomechanical integrity of the disk declines with age. Wear and tear on the disc causes oxidative damage to the proteins that make up the core of the disk. Over time, the joint becomes unstable and the vertebral bodies start to slip out of alignment. Some patients will develop degenerative disease of the lumbar spine without scoliosis, while others will develop significant scoliotic and kyphotic deformities. The reason for this is unclear: why do some people get degenerative disease without scoliosis, while some people get severe scoliosis. I presume that it may have something to do with posture, handedness, and asymmetrical forces acting on the spine over years and years of activities of daily living. Patients with degenerative scoliosis of the lumbar spine typically come to clinic with two complaints: (i) back pain and (ii) leg pain. In conjunction with their leg pain, they often have difficulty walking. Usually, their walking endurance has declined in recent years. Many of these patients will report that after walking a short distance they have to stop, sit down, lean forward. After a few minutes their legs feel refreshed and they are able to get up and walk again. Declining walking endurance is a symptom of neurogenic claudication. Claudication is a word that means cramping pain. In this case, the cramping pain is caused by spinal stenosis squeezing the nerve roots. The blood supply to the nerve roots in the lumbar spine is decreased by increased disk bulging associated with weight bearing. Forward flexion of the spine alleviates the pressure and restores the blood flow to the neural elements. Here are two slides from a famous pathological collection of images that demonstrate the changes that occur — disk bulging and ligamentum flavum hypertrophy — that cause stenosis. The first picture is from a young male, the second from someone in their 60’s or 70’s. The back pain associated with degenerative scoliosis of the spine is a mechanical ache. Patients typically feel worse at the end of the day or after spending a long time on their feet. The pain is typically in the midline but tends to radiate around to the hip in a “belt like” distribution, and they often have bilateral deep seated buttock pain. Here are several plain xrays and the MRI scan of a 60 year old physically active male with degenerative kyphoscoliosis of the lumbar spine and associated spinal stenosis. The plain xrays are taken in the standing position and they demonstrate that the disks have deteriorated and the vertebral bodies have started to slip out of alignment with respect to each other. There is an abnormal side to side curvature of the spine. 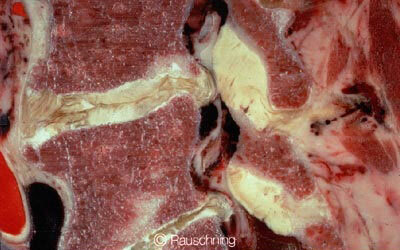 This is the scoliotic component of degenerative diseass. The anterior aspect of the lumbar spine has collapsed resulting in a flat or rounded low back. This is the kyphotic component of degenerative disease. CLINICAL HISTORY: Sciatica pain and weakness with numbness left leg. 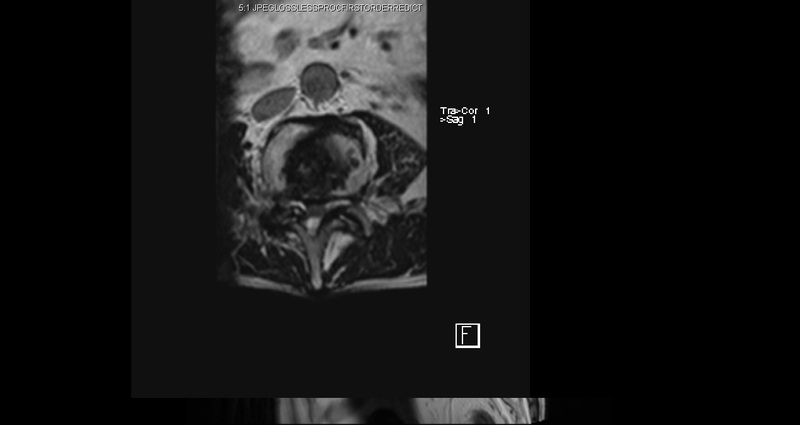 TECHNIQUE: Sagittal T1, sagittal STIR T2, high spatial resolution sagittally acquired 3D T2 SPACE which was also reformatted as axial T2 images, and axial Tl images were acquired on 1.5T Siemens Magnetom. Lower T-spine: Visualized portions of the lower T-spine from T9 to T12 are relatively normal in appearance for age without canal or foraminal stenosis and without any distal cord or conus imprint or compression. 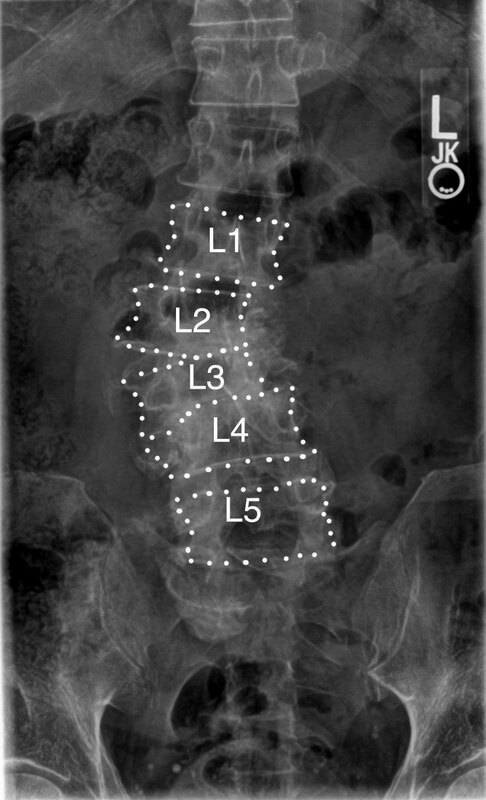 Posterior disc protrusions are seen at T6-7, T7-8, T8-9 and T9-10 levels. While these indent the anterior CSF space no frank cord compression is appreciated. 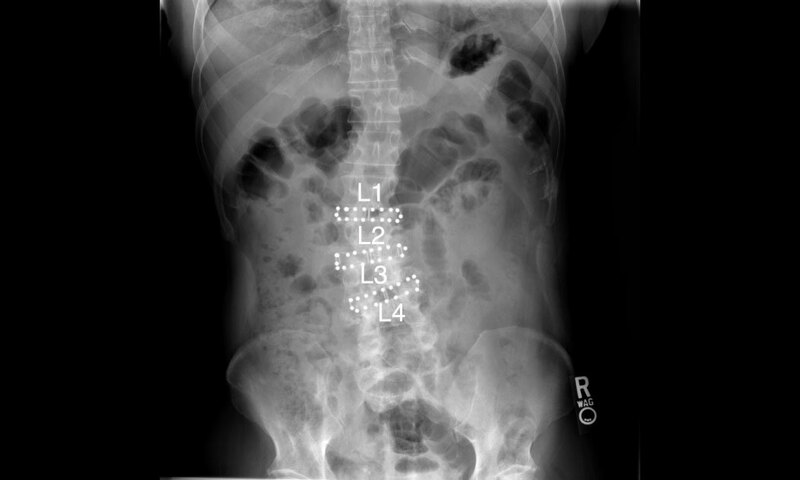 Alignment: Mild focal dextroscoliosis of lumbar spine at L2-L3 levels is present. 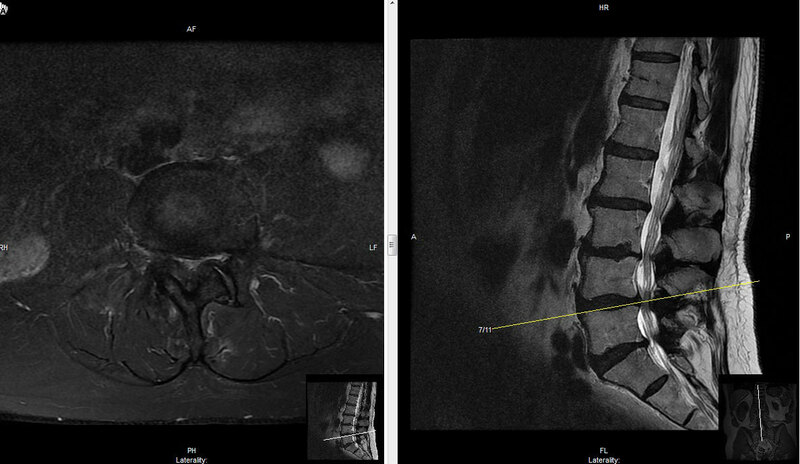 Degenerative translational spondylolisthesis to the right of L2 and L3 with respect to Ll and L4 is present. In addition L3 shows anterolisthesis with respect to L2 and L4. Anatomy: Nonnal vertebral anatomy is present in that the last rib bearing vertebral body is presumed to be T12 and 5 lumbar type vertebral bodies are present. The tip of the conus is seen at the T12-L1 level. T12-L1: Normal for age disc level. L1-2: Moderate degenerative disc disease is present. Broad posterior disc osteophytic ridging indents the anterior margin of the central CSF space without central canal stenosis and causes mild right foraminal narrowing and moderate left foraminal narrowing but no definite nerve root abutment, displacement or impingement is seen at this level. L2-3: Severe degenerative disc disease is present especially on the left with obliteration of the disc space and endplate irregularities. Broad posterior osteophytic ridging related to the anterolisthesis of L3, causes mild central canal narrowing but more importantly causes moderately severe left neural foraminal narrowing, moderate left lateral recess encroachment, mild right lateral recess narrowing and mild/moderate right neural foraminal narrowing. There may be some nerve root abutment within the lateral recesses but no definite nerve root impingement is seen at this level. L3-4: Severe degenerative disc disease is present due to Grade I, borderline Grade II anterolisthesis of L3. Osteophytic ridging in conjunction with facet arthrosis and hypertrophy results in moderate central canal stenosis with central nerve root abutment. More importantly there is severe bilateral neural foraminal narrowing with nerve root impingement suggested in both neural foramina. 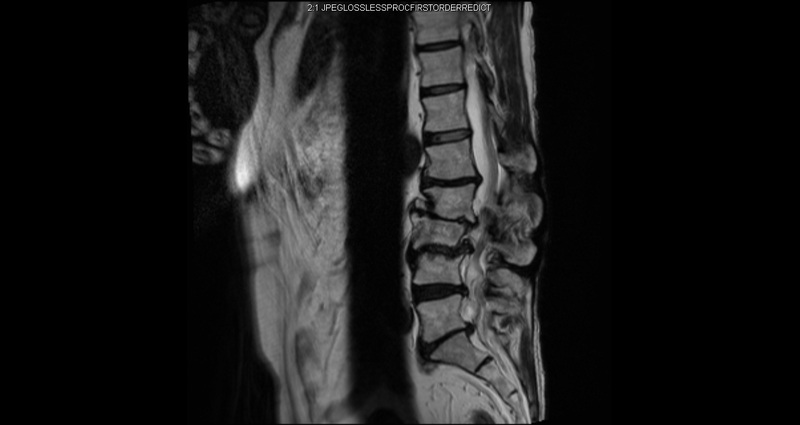 L4-5: Mild degenerative disc disease with 3-4 nun broad posterior disc protrusion centrally. This effaces the anterior epidural fat and minimally indents the anterior margin ofthe central CSF space without significant central canal stenosis. There is mild bilateral lateral recess encroachment with nerve root abutment but no definite displacement or impingement. Neural foramina are moderately narrowed on the left and moderately severely narrowed on the right with some nerve root abutment within the foramina but no definite impingement. 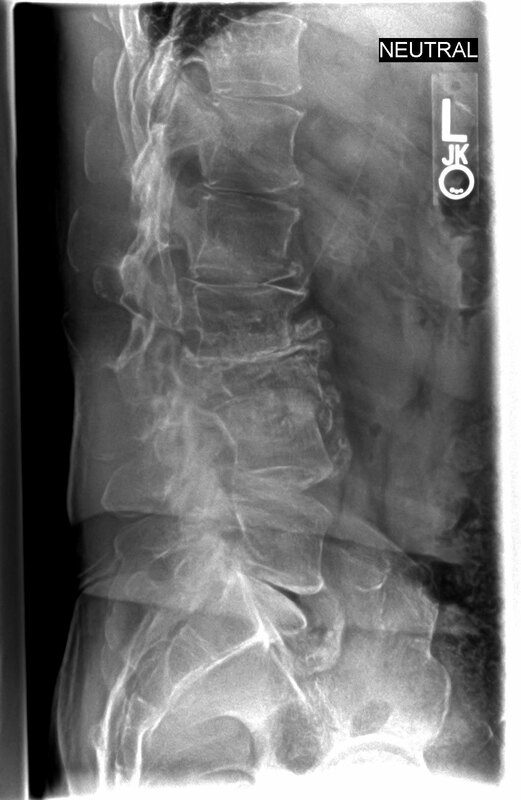 L5-S1: Moderate to moderately severe degenerative disc disease is present with large right anterior and far right lateral osteophytic ridging. Broad posterior disc osteophytic ridging effaces the epidural fat but no central canal stenosis is seen. 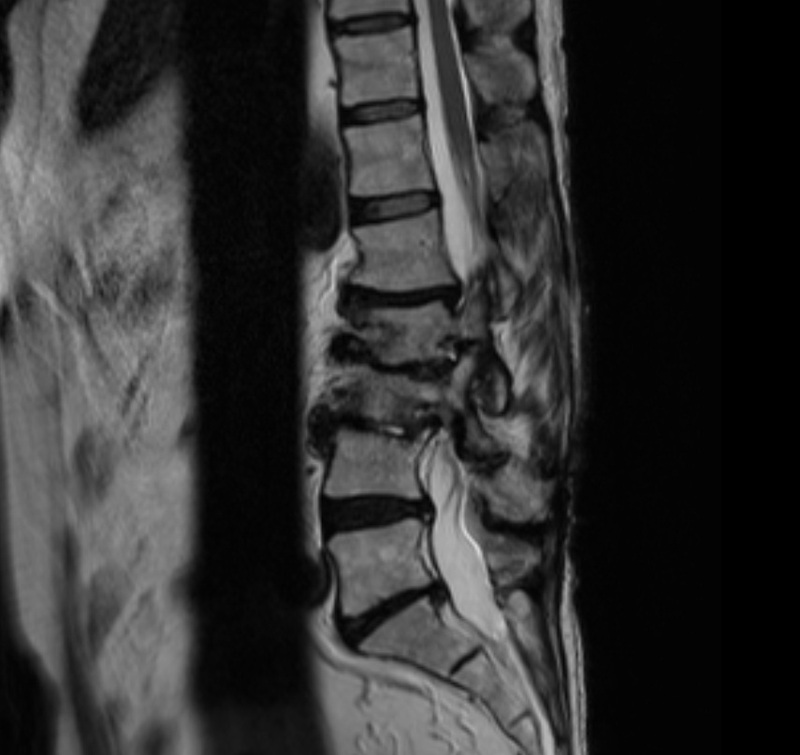 Broad posterior disc osteophytic ridging does abut descending nerve roots within the lateral recesses bilaterally. The right neural foramen is severely narrowed with nerve root abutment if not imprint. The left neural foramen is more patent without evidence of nerve root abutment. Facet Joints: Facet joints demonstrate asymmetical arthrosis at L1-2 and L2-3. Facet arthrosis is relatively severe on the right at L3-4. Mild arthrosis right worse than left is seen at L4-5 and L5-S1. Paraspinous spaces and soft tissues: Within normal limits. 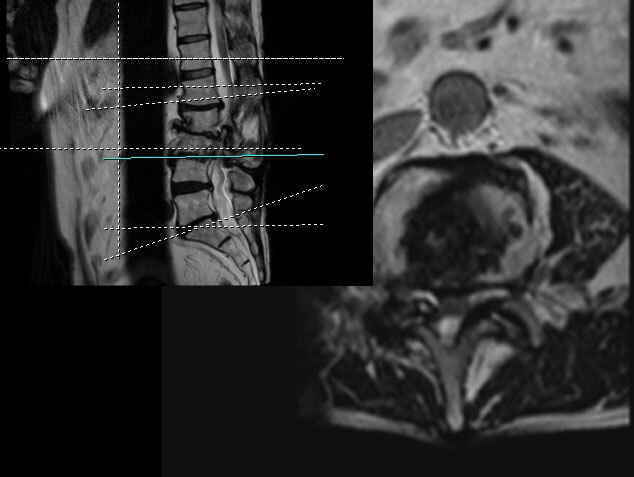 STIR images show disc dehydration L1 to S1 levels and there is marrow edema surrounding the severe degenerative disc disease changes at L3-4 consistent with active ongoing degenerative disc disease superimposed on chronic degenerative disc changes . 1. 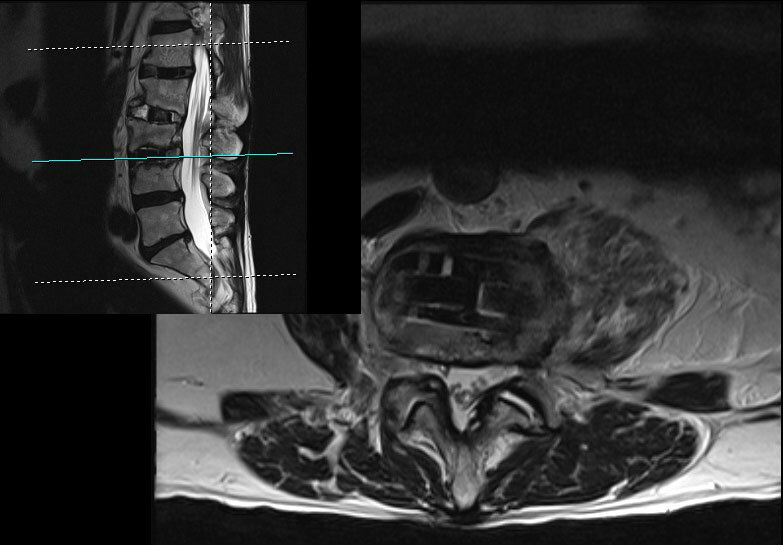 Grade I to borderline Grade II anterolisthesis of L3 with respect to L2 and L4 with severe degenerative disc disease at L2-3 and L3-4levels and severe foraminal narrowing at L3-4 with apparent nerve root impingement. 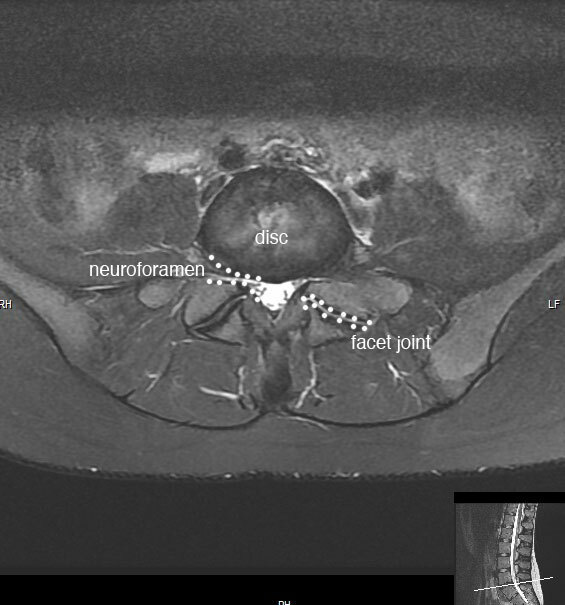 Serpiginous nerve roots within the lumbar levels are secondary evidence of nerve root impingement. 2. Relatively severe anterior and far right lateral osteophytic ridging at L5-S 1 as well as broad posterior disc osteophytic ridging L5-S1 that abuts nerve roots within the lateral recesses and appears to cause some imprint of the nerve root within the right neural foramen at L5-S1. These are the images from the MRI scan that demonstrate spinal stenosis. 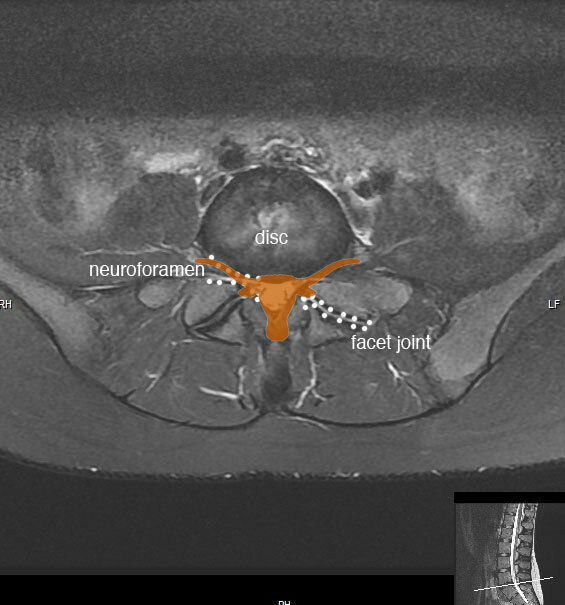 The axial images are often the most helpful, and I explain to patients that the normal spinal canal should look a little bit like the Texas Longhorn’s logo. You should be able to clearly trace the path of the neuroforamen along the length of the longhorn. In stenosis, the area at the base of the horn become obliterated by arthritis from the facet joint and disk space bulging. Approximately 10 years ago, a very innovative surgeon in Sao Paulo, Brazil, developed a novel technique for decompressing and stabilizing degenerative disease of the lumbar spine. He recognized that there is a surgical corridor to the spine through the side of the patient’s trunk — called the extreme lateral approach. This approach has many advantages over the standard posterior midline approach to the spine, and one or two distinct disadvantages. Via the extreme lateral approach, the intervertebral disks of the lumbar spine can accessed, and with the use of specially designed devices, the height of the disk spaces can be restored to their pre-degenerative height and alignment. A company in San Diego, California, known as NuVasive has been instrumental in developing the specialized tools and implants used during this surgery. 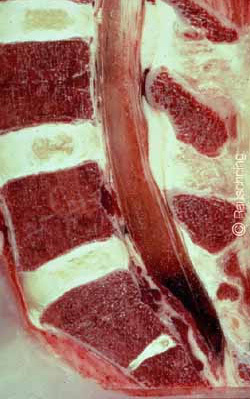 The advantages of the extreme lateral approach include the fact that the surgical approach (i) does not disrupt the large muscles of the back (ii) is possible with minimal blood loss (iii) allows for the insertion of intervertebral spacers that rest on a strong part of the bone called the apophyseal ring that provides an excellent platform for restoration of disk height and alignment. The disadvantages of this approach are related to the fact that intervertebral spacers must be carefully inserted through the psoas muscle without damaging a complex of nerves called the lumbar plexus. The psoas muscle is the major muscle that flexes the hip joint. There are techniques and special surgical tools available that make it possible to dilate surgical channels through the substance of the posas muscle with minimal bleeding, but some degree of posas irritation with thigh pain, numbness, and weakness in hip flexion is expected after the surgical approach. These symptoms seem to be transient and most patients report that their strength returns rapidly and any pain or weakness is minimal within a few weeks of surgery. The lumbar plexus is a dense collection of nerves that run through the substance of the psoas muscle. Nerve fibers do not tolerate much surgical manipulation so the key to this procedure is knowing where the nerves are so that they can be avoided. Nuvasive has pioneered a very innovative tool called Neurovision that makes it possible to stimulate the nerves with a tiny ball tip electrode so that the course of the nerves in the posas muscle can be visualized without being seen and therefore avoided. The operation is technically challenging but has great potential to treat this problem with limited tissue disruption. This patient was operated upon in the lateral position. Lying on his side, a 2 inch incision between the ribs and pelvis was made, and with careful surgical dissection, working channels were established in line with three degenerative disks — L1/2, L2/3, and L3/4. Prior to surgery these disks had basically completely collapsed, but during the course of surgery, 10mm high spacers made out of a biopolymer called polyetheretherketone (PEEK) were inserted into the degenerative disk spaces. This process restores disk height, restores spinal alignment, and increases the amount of space for the nerve roots in the spinal canal. On post-operative day #1, after a 1 night stay in the hospital, standing X-rays were taken of the spine and we also obtained a post-operative MRI scan. These images demonstrate the improvement in spinal alignment, disk height, spinal canal and neuroforaminal volume. In fact, the radiologist was kind enough to measure the the amount of improvement in the dimensions of the spinal canal. L1-L2: Ligamentum flavum hypertrophy with degenerative facet change. Mild narrowing of the left neural foramina. The central canal measures 15 mm. There has been interval improvement in the degree of neural foraminal narrowing on the left. The central canal is stable at this level. L2-L3: Ligamentum flavum hypertrophy and degenerative facet change. There is moderate osseous narrowing of the bilateral neural foramina, the degree of neural foraminal narrowing improved when compared to the prior study. The central canal measures 17 mm, this is also improved from 10 mm. L3-L4: Ligamentum flavum hypertrophy and degenerative facet change with moderate narrowing of both neural foramina. The central canal measures 14mm. There has been improvement in the degree of neural foraminal and central canal narrowing when compared to the prior study, with the central canal previously measuring 8 mm. L4-L5: Ligamentum flavum hypertrophy and degenerative facet change with a broad-based disc bulge. There is moderate narrowing of the right greater than left neural foramina. The overall appearance is stable. The central canal is widely patent, measuring 12 mm. This surgical procedure for decompressing and stabilizing the lumbar spine is possible with relatively minimal blood loss, a short 1 or 2 day hospital stay, and a relatively quick recovery. In published reports, the fusion rate is very favorable and in carefully selected patients it appears that it is possible to accomplish the goals of surgery — increasing space available for the nerve roots and realigning the spine — without resorting to supplemental posterior fixation using traditional pedicle screws. Dear Dr. Gollogly, I have read the material here and on your web page and have found it informative. I have one question: What should I expect when I return home from the operation and hospital stay? Do I need to make any special accommodations at for sleeping, sitting, etc? You said I would be wearing a back brace of some sort. How will that limit my movement? My response follows: After your operation you should not need to make any special accomodations for sleeping or sitting. We will fit you in a lumbar brace that you fasten around your waist with velcro. It looks like the sort of brace that you see the stockers at the supermarket wearing. It supports your spine and prevents a little bit of movement, but it is not too restrictive. It’s a soft brace, not a hard plastic shell. You should try to avoid any kind of heavy lifting and sustained flexion (being bent over) of the lumbar spine for the first 6 weeks after surgery. The brace helps to remind you to sit up straight, walk with good posture, and rather than bending over to pick things up off the ground, use your legs. I have seen two different kinds of Dr. One an Orthopedic Surgeon and the other a Neurosurgeon. Each have recommended a different treatment. I am confused. L3-L4, Severe facet arthropathy with degererative anterolisthesis. Severe central canal and lateral recess stenosis. Moderate left and mild right foraminal stenosis. Neurosurgeon says he will “rheam out the bone” This approach sounds very painful and detrimental but I trust this surgeon a lot. He has a very good reputation. I don’t know what to decide. How do you know if you have spinal stenosis? Why do annular tears hurt so much? 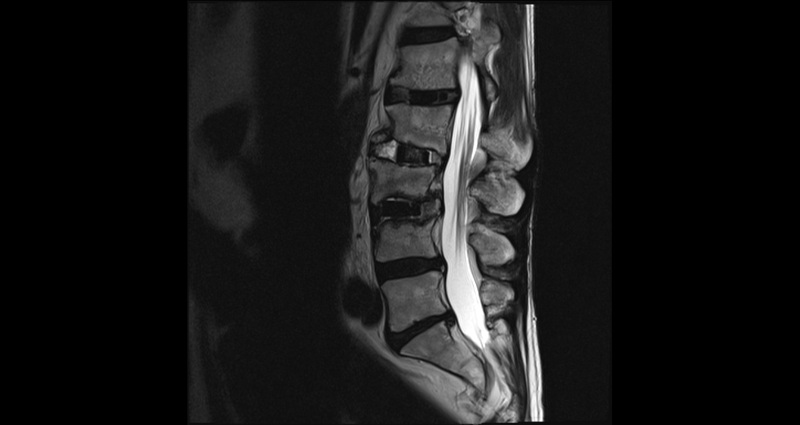 Spondylolisthesis: can it be reversed? Sohrab Gollogly, MD is a board-certified orthopedic surgeon and Fellowship-trained spine surgeon who also performs scientific research and participates in several volunteer surgical organizations. Dr. Gollogly completed his undergraduate education in biology at Reed College in Portland, Ore. He earned his medical degree from the University of Washington School of Medicine.